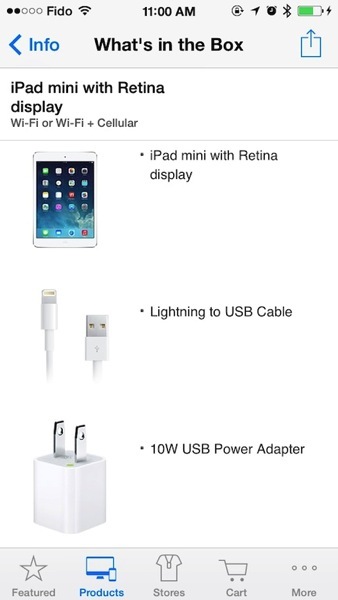 Last year’s iPad mini shipped with a regular 5w USB power adapter normally used for iPhones. Since the iPad mini had a smaller battery than the 9.7-inch iPad, a 12w power adapter normally included with the latter was not necessary and also kept costs down. This new 10w power adapter is not available for purchase on Apple’s online store in either Canada or the USA. Only the 5w and 12w adapters are available for $21 each. The higher powered 10w USB power adapter should allow the Retina iPad mini to charge much faster than before. Assuming Apple was able to bump up the battery’s capacity to power the high powered Retina display, the need for faster charging is definitely relevant in this case. We’ll find out soon enough once Retina iPad mini teardowns happen in November after launch.